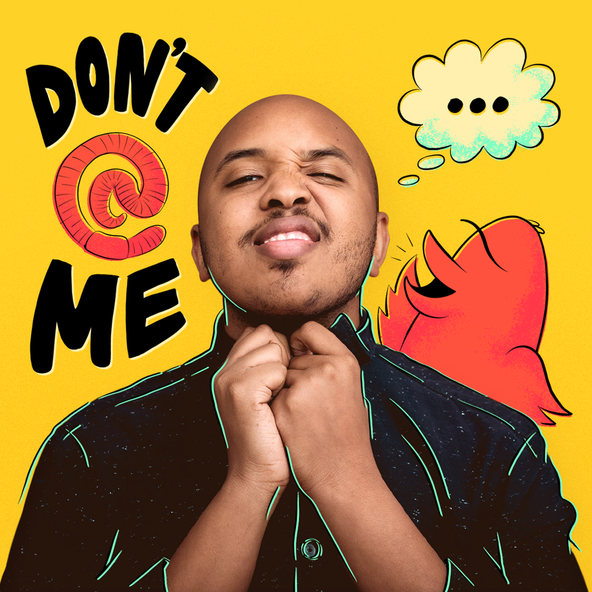 Check out a treasure trove of “clean trash” and get your creative juices flowing; hear USC’s newest dean discuss architecture and race; experience sugarcoated sculptures with a dark side; tour DTLA by moonlight; and see Cuba’s take on Hollywood movie posters. 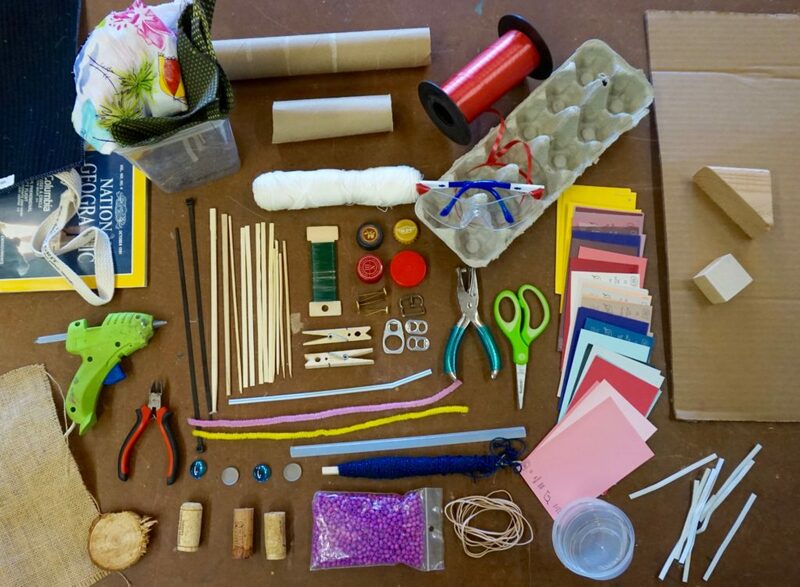 Discarded materials find a new life at the reDiscover center. 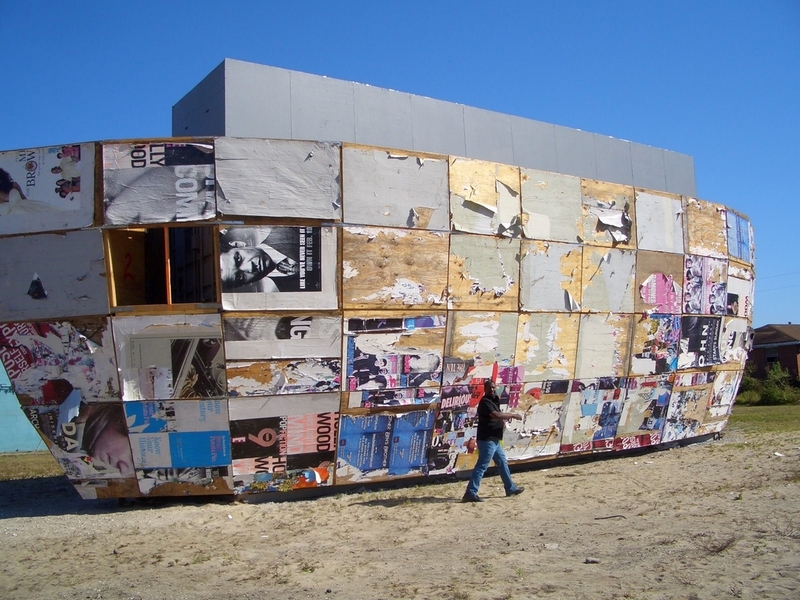 In 2003, graphic designer Mary Beth Trautwein started collecting “clean trash” to be re-purposed for art projects — cardboard boxes, bottles, egg cartons, post-iTunes CDs, PVC pipes, building materials and much more — stuff that would otherwise fill our recycle bins or worse, the landfill. She and her colleagues collected so much stuff, they eventually needed a 2,000 square foot space to house it all, and the programming expanded. The center now offers a range of art classes and camps and sells salvaged and up-cycled materials to artists, educators, and the public at rock bottom prices. Now you can check out the reDiscover Center for yourself at this week’s open house event. Get excited about tinkering and making: a win-win for the environment, education, the arts, teachers and artists and the community . Milton Curry explores architecture and its interconnection with race as the new Dean at USC’s School of Architecture. USC School of Architecture has a new dean: Milton S.F. Curry, who brings from past teaching experience (University of Michigan Taubman College of Architecture & Planning, Cornell and Harvard) a strong point of view about urbanism, modernity, and “racialized thinking.” He will address the philosophical and aesthetic underpinnings of race, urbanism, social constructs of identity and notions of egalitarianism in the school’s 2017 inaugural lecture. Tickets: Free and open to the public. Click here for more information. No reservations are required. Parking is available on campus at the Downey Way Gate off 36th Place and Vermont Ave.
With colliding elements of bright and dark, innocence and desire, sweet and fierce, Scott Hove creates a macabre beauty in these arrestingly almost edible sculptures. 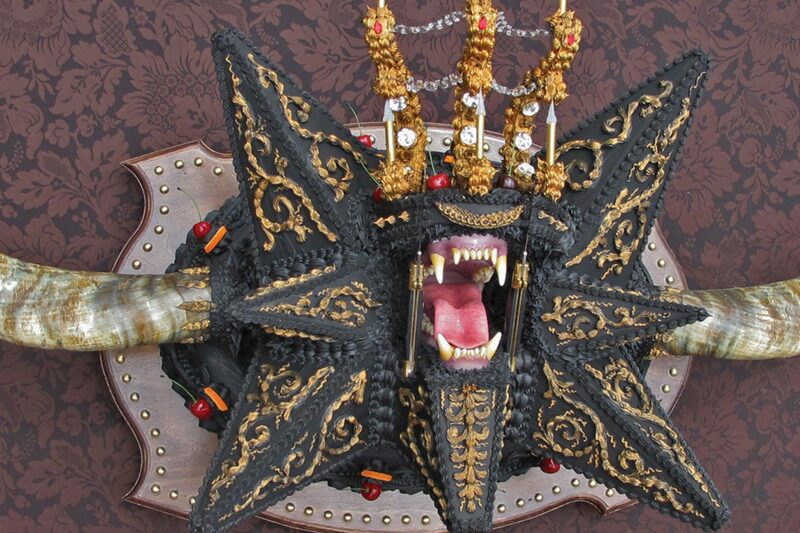 Artist Scott Hove, a contributor to Banksy’s Dismaland, recently created his own tasty installation in Los Angeles called Cakeland, a maze of large-scale, brightly colored cakes with garish adornments and protruding horns, knives and snarls. Now he is back with a two-part, two-location show called “Last Ticket for the Beauty Train” in which the artist employs sugar-coated acrylic “frosting” and decorative piping on around 30 sculptures and installations to examine what he terms “the failures of the Illuminati, the institutions that have both controlled us but also defined our way of life and their inevitable collapse of control.” These ideas are explored in a fully-immersive, walk-through installation at gallerist Merry Karnowsky’s Chinatown pop-up space (the artist’s Infinity Room is the banner image at the top of this page), and in a multi-media art showcase at Karnowsky’s permanent gallery location on La Brea, KP PROJECTS. Tickets: Free. RSVP@kpprojects.net to attend both opening receptions. The Modern by Moonlight walking tour takes a special twilight-infused look at the Bunker Hill area of Downtown Los Angeles. 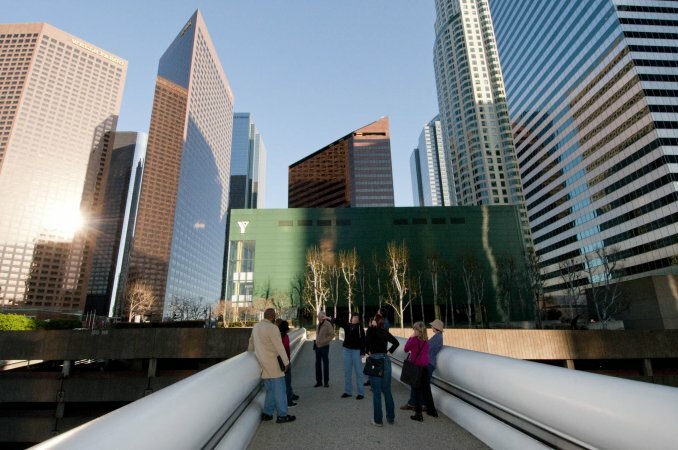 Whether you’ve lived here for decades or are new to town, the LA Conservancy walking tours are a great way to learn about the city. As of this writing, you can still join the upcoming Modern by Moonlight Walking Tour, during which you’ll explore the city’s most iconic modern structures under a twilight sky on a late summer evening. By day, the glass and steel towers of these buildings exude corporate power. By night, glowing windows, evocative lighting, and reflective skins transform these Modern monoliths into a beautiful and mysterious landscape. This ticketed walking tour takes an evening stroll among the architecture, public art, and plazas of downtown’s Bunker Hill area. It ends at the BonaVista Lounge at the top of the futuristic Westin Bonaventure Hotel. Where: Location details provided with reservation confirmation. Tour starts within a few blocks of the 7th/Metro Center station, serving the Red, Purple, Blue, and Expo lines. For details, visit metro.net. 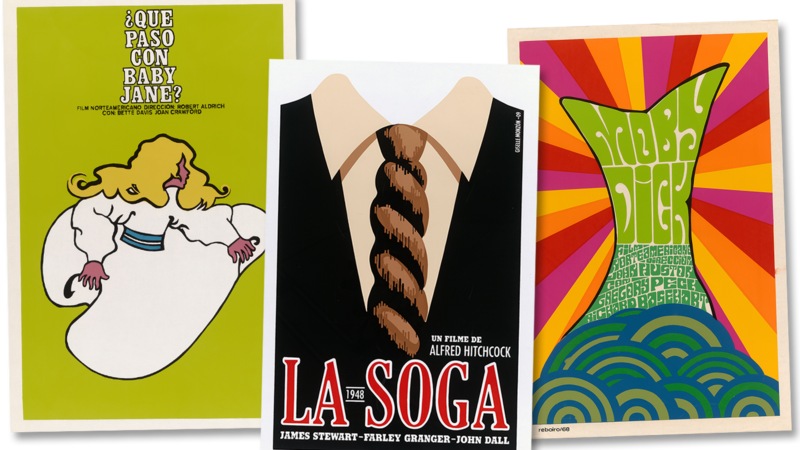 The Pasadena Museum of California Art has put together a fascinating show of 40 silkscreened Cuban posters publicizing Hollywood films from the 1960s to 2009. These posters, produced by the Instituto Cubano del Arte e Industria Cinematográficos (ICAIC) or the Cuban Institute of Cinematographic Art and Industry, were, says the museum, “part of an initiative of Fidel Castro’s revolutionary government to develop cultural awareness and consciousness.” The embargo meant limited access to materials so the screen prints created for the American films tend to use bold imagery to depict “an iconic element or moment in the film, such as the umbrella in Singin’ in the Rain,” instead of photos of the movie star’s face, and draw from a variety of artistic styles, including Art Nouveau, abstraction, Pop, and Op. This exhibit is the first of many Pacific Standard Time LA/LA events, focusing on Latin American and Latino Art in LA, most of which will start Sept 9. When: Now through January 7, 2018. Tickets: General Admission $7; click here for more information.